Randy Reiger has created not just a wild scooter, but also a backstory from an alternative history. I'm a fan of history, both real and imagined. Alternative history is an interesting genre in its own right. 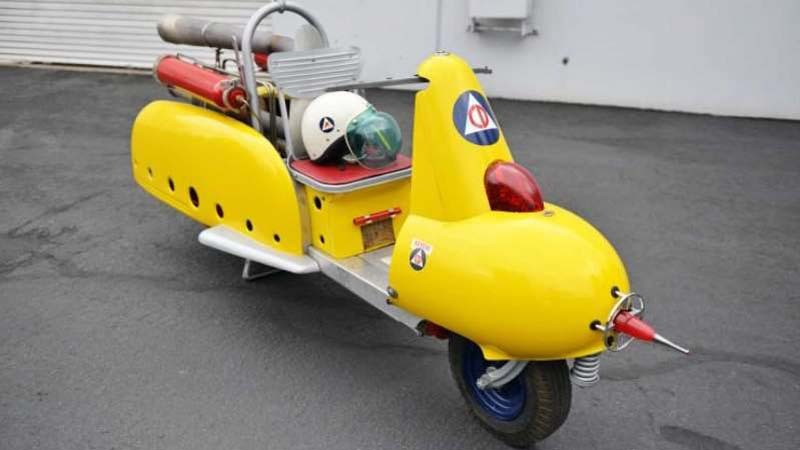 Randy Reiger played this "what-if" game and came up with not only a unique scooter that looks like it came from the Cold War but an entire history, complete with artifacts, that stretches far beyond the scooter itself. The scooter itself is an entirely custom job. Its design started with a pair of period-correct rear fenders from a 1950 Plymouth Business Coupe. From there, Reiger built the rest of the scooter primarily for looks that match the era in which it was supposedly designed, drawing from both ground and air transportation of the time for inspiration. 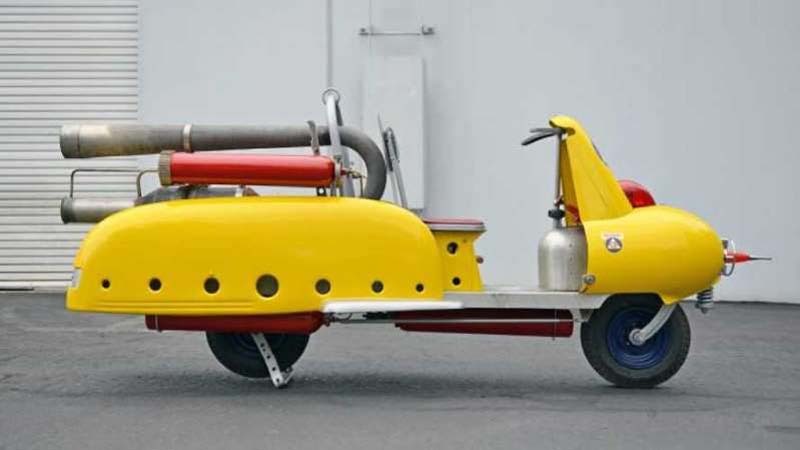 He scavenged all of the parts except the pulse jet itself from vintage vehicles of various types, modifying them to fit the design of this retro-futuristic scooter. The pulse jet itself is custom made, decided upon because it's the most ridiculous form of space-age propulsion Reiger could think of. Keep in mind that around this point in history, the Soviet Union was designing a nuclear-powered bomber, while the U.S. experimented with Project Orion, which used a series of nuclear bomb detonations to launch a satellite into space. What could possibly go wrong? At least as impressive as the scooter is the back story and "merchandising" that goes with it. The display includes a model kit of the scooter as well as a kid's toy in their "original" 1950s packaging. Even the various displays around Kansas City, Missouri over the past few months carried on the alternative history theme, presenting the scooter as if it was a rare artifact that had just been discovered after the Revere Wardens program was shut down in the early 1970s. The only thing Reiger has not yet done is to ride the scooter himself. He built it to be fully operational, pulse jet and all, but has not yet put it to the ultimate test.